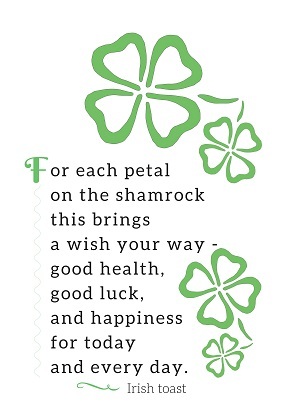 The celebration involves the wearing of green (shamrocks, clothing or accessories) and drinking plenty of Guinness… if you like it. If you don’t – I believe Guinness is an acquired taste -, then you can still cook or bake with it (Chocolate Guinness cake, anyone?). I will take this opportunity to apologise to the Irish people, but I don’t like Guinness. I visited Dublin a few years ago, spent the weekend there (absolutely loved it, by the way! ), tried Guinness … and didn’t like it. I don’t like beer in the first place, but Guinness is much bitterer than regular beer so I believe that either you have to be born liking it, or go to Guinness camp for training. Thankfully, there are plenty of great foods in Ireland. Great, and often simple. 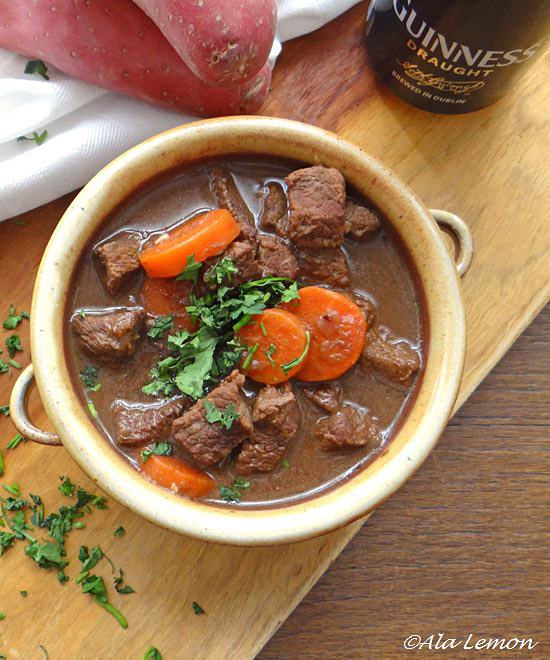 Beef and Guinness stew (or Irish stew) is one of them. 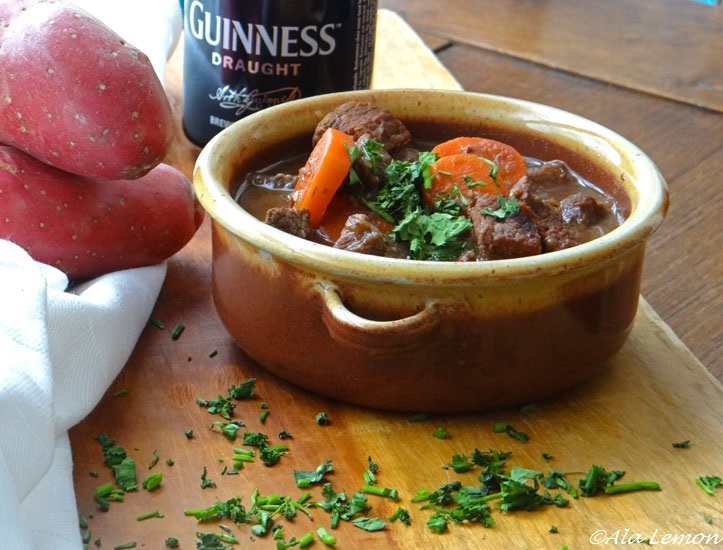 Many Irish American recipes I found use various ingredients, such as parsnips, tomato paste, sugar… But less is often more, so I stuck to a more classic recipe, which I hope you’ll like. Oh, and there’s a secret ingredient. Something you probably wouldn’t expect to see there but which cuts through the bitterness of the Guinness. Totally optional, of course. In a large saucepan, heat the oil over medium-high heat. Once your oil is hot, brown the beef. Do it in 2 batches if you need to, to allow an even browning on all pieces. Set aside. In the same pan, fry the onion, garlic, carrots and celery, about 3-5 minutes, before adding the meat back. 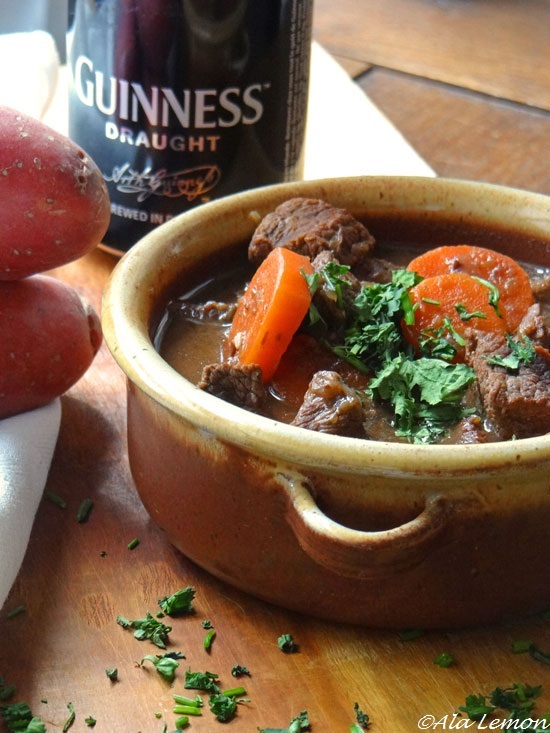 Pour in the stock, the Guinness, add the bay leaf and season to taste. Add the chocolate if you find it too bitter. Bring to a boil then lower the heat and simmer for about 1½ hours, or until the liquid has reduced. If the sauce isn’t thick enough, remove the meat and carrots from the pan using a slotted spoon. In a small bowl, mix a few tablespoons of sauce with 1 tablespoon corn flour, whisk until well combined and pour back into the sauce. Let boil for about 10-15 minutes, until the sauce has thickened, then tip back the meat. Lovely recipe indeed and very tasty, I can confirm, and goes fine with the mash (and with steamed potatoes too). Don’t forget the mace on the mash!!! I’m afraid I do not understand. The mace on the mash? This sounds so good. you can’t beat recipes like this. Thanks for sharing.